A corridor linking Shia in Iran, Iraq and beyond with Shia and Alawites (a related sect) in Lebanon and the Syrian coast would be a strategic nightmare for Israel. The downing on June 18th of a Syrian Air Force SU-22 by a UA Navy F-18 Super Hornet over the skies of northern Syria sharply raises the stakes in the emergent stand-off in the country. This stand-off is no longer between local militias, nor between regional powers. Rather, through interlocking lines of support, it places the United States in direct opposition to Russia. The last move has almost certainly not yet been made. And while events in north east Syria may seem a distance away, there is a direct Israeli interest in the outcome of the current contest. This latest move was a probably inevitable outcome of two sharply opposing outlooks currently in play in Syria. The US seeks to maintain a divide between the war against Islamic State in the east of the country and the civil war between Assad and the rebellion against him in the west of it. 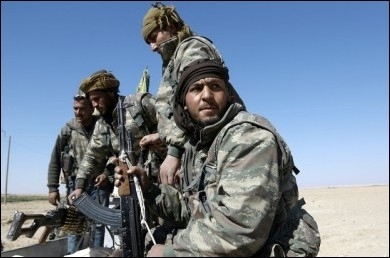 In the east, US-supported Kurdish and Sunni Arab rebel forces are forbidden from attacking Assad's forces. From the point of view of the regime and its Russia and Iranian allies, by contrast, no such division exists. For them, the Syrian war is a single system, in which the 'legitimate government' (ie the Assad regime) is engaged in a fight against various illegitimate entities. The latter group includes ISIS, but also the Sunni Arab rebels and the Kurdish-dominated Syrian Democratic Forces, with whom the US is aligned. The defeat of the Islamic State as an entity controlling territory is now only a matter of time. The recent Astana agreement for the creation of four 'de-escalation' areas has freed up regime and allied forces to take a more active role in the war against ISIS further east. Regime forces are advancing along two axes – from Palmyra in the south, and from Aleppo province further north. The second axis is bringing the regime and its allies into direct and close proximity with the US-supported SDF. The incident this week took place, according to the US version, after regime forces attacked the SDF in the town of Jadin south of Tabqa. Further tactical clashes are probably inevitable as each side seeks to take control of areas abandoned by ISIS as it retreats. But these tactical matters are part of an emergent strategic reality. The defeat of the Islamic State as an entity controlling territory is clearly only a matter of time. The actions of the Assad regime (or more accurately the Iranian and Russian interests that dominate it) equally clearly reflect their determination to confront and defeat all other armed elements within Syria. The United States is currently backing certain non-governmental armed elements in Syria, for the stated purpose of defeating Islamic State. So the situation is leading the US inexorably toward a choice. At a certain point, perhaps after the final eclipse of IS, but also perhaps before it, Washington will need to decide if it wishes to abandon its allies to destruction at the hands of the regime, Iran and Russia, or whether it wishes to help to defend the forces it has armed and trained. US-backed Syrian Democratic Forces (SDF) fighters are leading the assault on Raqqa. At this point, the US will need to decide its end objective in Syria. Is it a federalized, decentralized Syria, with the regime dominant in the west and US allies in the east? Is it the destruction of the Assad regime? The construction of safe zones and ongoing negotiation? Which is it to be? None of this is easy and all choices have a price. Failure to decide, and a tactical, localized response to immediate threats is also a kind of choice, of course. So far, this type of response has resulted in the pro-Iranian forces reaching the Iraqi border, north of al-Tanf, and cutting off the US-backed rebels in the area from the possibility of further progress northwards. As of now, on four occasions, US forces have responded to the regime coming too close. But this has the appearance of a piecemeal response. All sides await the discovery or emergence of US strategy in Syria. 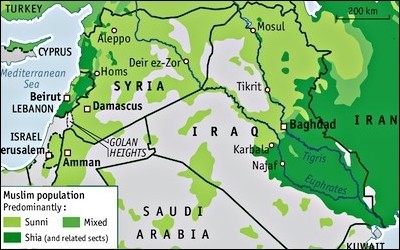 If the US and its allies are eclipsed in eastern Syria, Iran will enjoy a contiguous land bridge to Israel's borders. Why does all this matter for Israel? For the following reason: if the US and its allies are eclipsed in eastern Syria, the result will be the establishment of a contiguous land link from Iran, across Iraq and Syria and to Lebanon and the Israeli border. This in turn will transform the threat picture facing Israel in the event of a renewed war with Hizballah. This is not only or mainly to do with the transfer of weapons systems to the Lebanese Shia jihadis. One must observe and study the style of war that Iran has conducted in Syria and Iraq over the last half decade to grasp this essential point. In both contexts, with no official Iranian declaration of war, a coalition of Teheran-aligned militias have acted in a coordinated fashion on behalf of Iranian allies and interests. This coalition of forces has played a crucial role in the survival of the Assad regime. In Iraq, a similar coalition of Iran-aligned forces played a crucial role in the fight against IS, and now constitutes the key instrument of power in that country. At no time have the pro-Iranian forces been constricted by nominal state borders or 'national' divisions. Lebanese Hizballah personnel have played a vital role in Syria and have been present also in Iraq. Iraqi militiamen have been active in Syria. Afghan fighters were among the first to reach the Syria-Iraq border on June 9th. Pro-Iranian forces aren't constricted by nominal borders or 'national' divisions. There is no reason for Israeli planners to assume that a future war with Hizballah would be immune from this pattern. To reiterate, it does not require a formal declaration of war from Iran. Proxies are mobilized and deployed under the stewardship of the IRGC, but with no direct or acknowledged involvement given or demanded from Iran at any stage. The loosely and ambiguously governed nature of these territories would serve as an advantage for the Iranian forces, perhaps providing the kind of diplomatic cover for them that the presence of the toothless Siniora government in Beirut did in 2006. Thus the tried and tested Iranian model of revolutionary warfare. The creation of a contiguous corridor all the way from Iran to Lebanon would make possible the prosecution of such a war at an appropriate time and opportunity for Teheran, against Israel. For this reason, the prevention of the emergence of this direct land route through eastern Syria is a direct Israeli national interest. Unfortunately, the tactical and piecemeal nature of the US response, and the apparent absence of a clearly formulated strategy to face the Iranian, Russian-supported advance may yet facilitate its creation. Perhaps a clear strategy will yet emerge. It is Trump's move.